With their discreet, low level bar settings, these five round brilliant cut diamonds weigh a quarter of a carat each but still sit neatly next to most engagement rings. The bar setting is also regarded as one of the safest and trouble-free setting styles. 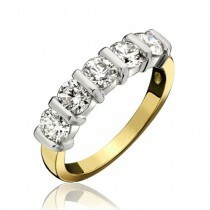 This one is made in 18ct yellow and white gold and has a total diamond weight of 1.21cts. Four and seven stone and all white gold or platinum versions are also available.